A twist on the traditional Mexican taco recipe! Lentils are a great alternative to meat in tacos for a plant based diet or if you are simply wanting to explore other healthy protein options. They are economical to buy, easy to cook, and can be used in so many dishes. 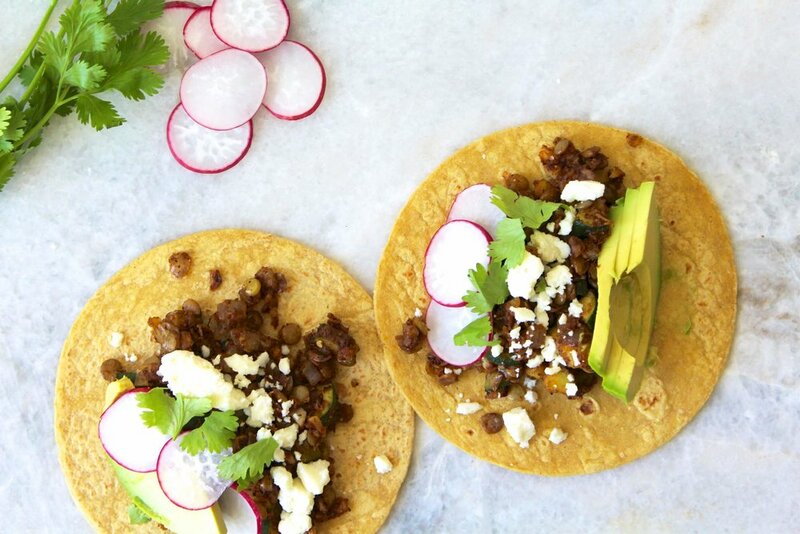 For this healthy taco recipe, these delicious lentils mimic ground beef and are equally as satisfying. Mix seasoning mixture together in a prep bowl and set aside. Heat olive oil in a large pan over medium heat. Cook the onions until translucent. Add the garlic and sauté 2-3 minutes. Next add the zucchini and cook for another 5 minutes or until zucchini is soft. Add the lentils and seasoning mixture to the pan with a little more olive oil and stir to combine. Cook another few minutes until everything is hot. You may need to add a tablespoon or two of broth or water if lentils get too dry. Heat tortillas in a skillet or wrap in a damp paper towel and microwave for a few seconds. Once the lentils are done, assemble tacos with cheese, salsa and desired toppings!